Welcome job seekers to our enhanced IT job board platform. Whether you’re an active or passive job seeker, we have the right mix of the hottest job opportunities, industry content, and insights to further your professional career. These pro tips provide guidance for most job seeker-related questions as you use our site. 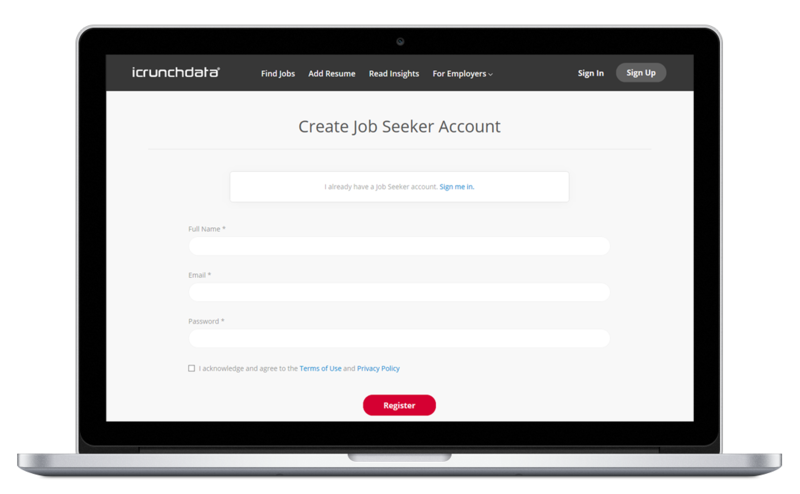 While registration is not required to apply to most jobs, it's recommended that you create a free job seeker account on the icrunchdata IT job board for many reasons. As an account holder, you'll gain access to experience an elegant job seeker dashboard to manage your account and job seeking activities. Further, you'll be able to build your professional profile, add multiple resumes, and keep track of your job application history. We understand the importance of highlighting your unique skills, so you’ll find a comprehensive list of skills from which you can multi-select (up to 10) that helps with system targeting and separates you from the crowd. We take great interest in understanding and appreciating your unique tech and data-related experience and skill sets. If you would like to provide feedback or request additional skills be added or offered, and you feel they may also benefit our entire audience, please send us a message and we'll do our best to accommodate. When it comes time for you to add your resume, we offer a few different types of resume products including Basic (free), Pro, and Elite. The free Basic resume offers general exposure and availability to employers and recruiters who use our site and have been granted access. The Pro and Elite resumes are sponsored, highlighted in search, and provide more exposure to employers and recruiters. You can mix and match resume types, add, and manage multiple versions of your resume. As an account holder on icrunchdata, you’ll have control of privacy settings to make each of your resumes active or inactive. Resumes that are inactive are not searchable, while active resumes are searchable by employers and recruiters. You’ll have complete control to apply to the jobs you like, and your application history will remain private. We take your privacy seriously by maintaining multiple layers of security for your protection (including site-wide SSL encryption) and leveraging machine learning in numerous aspects of our infrastructure. If you’re an active job seeker, it’s recommended to search for IT jobs and data jobs proactively on our site. Our newly-enhanced platform provides job search for exclusive content from employers native to our site and job content from third-party network partners. It's important to understand that many of the jobs found in search are hosted on individually owned and operated career sites that which icrunchdata does not own nor control. So please be aware of their individual terms, conditions, and privacy policies for each respective destination to be sure you are comfortable interacting with their sites on a case-by-case basis. data analyst, data scientist, software engineer, software developer, cybersecurity specialist, sas programmer, web developer, big data engineer, iot architect, advanced analytics analyst, marketing analytics analyst, artificial intelligence developer, statistician, machine learning developer, php developer, it specialist, data analytics specialist, .net developer, chief technology officer or java developer. If you’re the type of professional who is mostly happy in your current role, but consider yourself open minded to new career opportunities, then our job alert program is a great passive strategy. Signing up for job alerts is a lightweight approach that leaves all the heavy lifting to us when it comes to your job search. 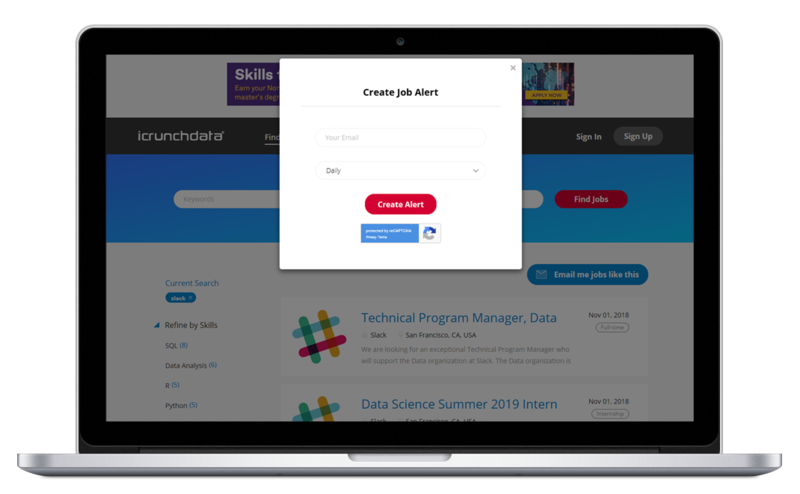 Our exclusive job alert program allows you to receive IT jobs and data jobs directly to your inbox from any search results page. The customization to your job alerts is automatically embedded when performing a keyword and location job search. Our platform is smart and will parse by keyword, skills, and location. You can unsubscribe from your job alerts whenever you’d like and add new ones on the fly. 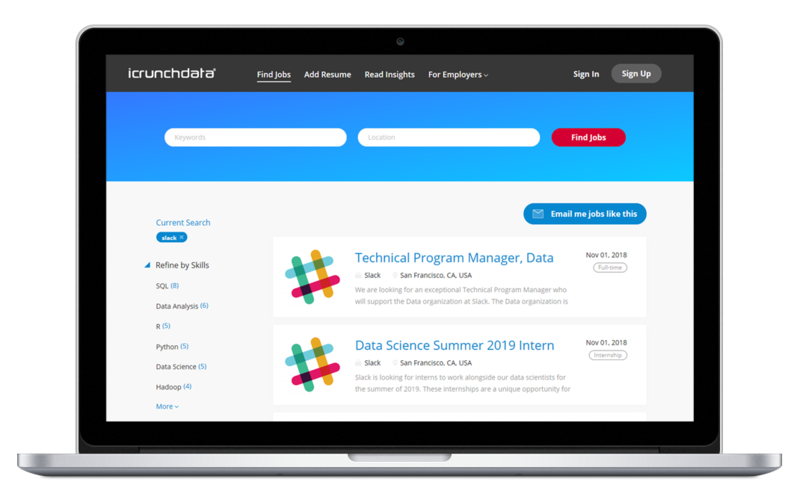 It’s an outstanding way to keep your fingers on the pulse of the latest hot jobs in technology and data. Or if you want to sign up for our generalized job alerts so that you are aware of all new jobs posted on our site, you can do that on the homepage here (scroll towards the bottom of the homepage). Thanks for being an important part of our long-standing community. We’re very glad to see you here, and hope you enjoy your stay. Get started now by registering as a job seeker.